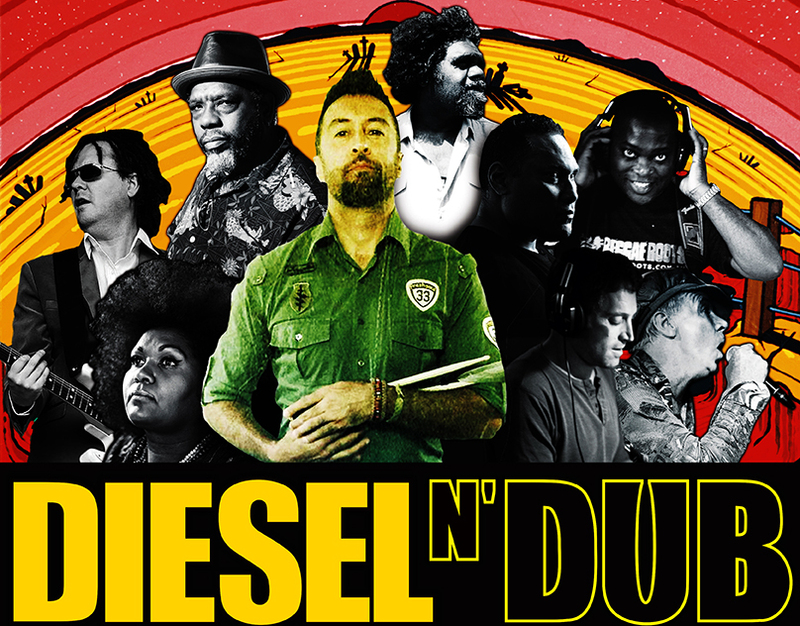 Declan Kelly takes Dieseln’Dub on the road to launch the new CD along the East Coast of NSW with a bunch of special guest vocalists from the album. The tour kicks off at The Rhythm Hut on Friday 17th October on the NSW Central Coast with singers Radical Son, Pat Powell, Tony Hughes and DK himself on vocal duties, supported by Aussie reggae royalty King Tide in one big rollicking night on the coast. The Factory Theatre in Sydney follows on Friday 31 October with Emma Donovan flying in to join on vocals; and then the mighty juggernaut travels south to showcase at the Hi Fi Bar, Melbourne as part of the official AWME program, making up a huge bill with Nahko and Medicine for the People, Batucada Sound System and Bullhorn. Friday 28 November sees Dieseln’Dub take on the Motor Room in Brisbane, wrapping it up as the closing act for the Rock the Gate festival at The Enmore Theatre on Sunday 30 November. Full details below. For the first time ever Kelly’s massive dub juggernaut hits the road. A huge event of uplifting, soulful reggae and deep dub vibes that’ll stay with you long after the show. Featuring special guest vocalists Radical Son, Pat Powell and Tony Hughes. Supports to be announced. Early bird community rate of $18 this weekend only (promo code: community). Tix $20 pre-event / $30 on the door if not sold out. Featuring special guest vocalists Frank Yamma, Radical Son, Pat Powell and Tony Hughes. Tix $30 pre-event / $35 on the door if not sold out. Nahko & Medicine for the People, Batucada Sound Machine and Bullhorn. With special guest vocalists Radical Son, Tony Hughes and Pat Powell. Free entry for this one! First in, best dressed.